1. 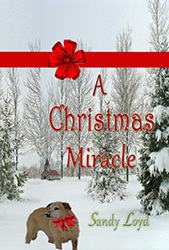 Sandy, I hear you have a pet in your story, A Christmas Miracle, which—as the title suggests—is a Christmas story. Tell us about the book. A Christmas Miracle is the first book in the series, and it’s based on a true story that happened on Christmas Eve right after an ice storm. I wanted to immortalize the event, so I wrote a quick story about it. Since I write contemporary romance, I created a sweet romance in that involves a Labrador retriever we found half-starved at a lake where we owned a cabin. Megan Jenkins isn’t looking forward to Christmas. The holidays will forevermore remind her of what she had and lost. Her husband, and love of her life, died a few days after Christmas the year before, leaving her a young widow with a fatherless son to raise. During the course of this Christmas Eve, Megan experiences her own Christmas Miracle as she learns the true meaning of giving with the help of Kevin Murdock, a long-time friend who’s always been there for her. 2.Why did you add a pet to A Christmas Miracle? Since this story is based on a true event, the dog in the story is necessary for the plot. As mentioned above, Buddy was a stray. He was the sweetest dog, and I couldn’t fathom why anyone would be so cruel as to leave him on a rock in the dead of winter. I have to admit to being more of a cat person, than a dog person. I love dogs, but I never wanted one. Let’s be honest, dogs require a lot of attention and work that cats don’t need. Still, I took Buddy in, even finding him a home. But before the new owner could pick him up, I fell in love with him, which happened in the span of a few days. Buddy is the dog on the book’s cover. He’s worth all the extra work because he gives so much back. Not long after adopting Buddy, I took in another stray that both my husband and son still give me grief about because she was the ugliest cat. My niece was fostering her and her kittens. The kittens were adorable. I knew they’d be adopted, but Sylvia, the ugly momma cat who was a kitten herself, would most likely spend the rest of her days in a cage. She was too sweet for such a fate. 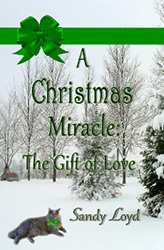 Sylvia is the inspiration for my second book in this series, A Christmas Miracle: The Gift Of Love. For all who are searching for their someone special. May the gift of love reach your hearts this holiday season. Angie Reynolds’ heart aches for a husband and family of her own. Unfortunately, she’s looked for love in all the wrong places with nothing to show for it but disappointment. None of the guys she’s dated is worthy of her, including her ex-husband. This Christmas season looks to be another one spent alone. Yet until Angie realizes her own worth, she will never be able to accept the gift of love from someone like Brad Miller. As you can tell by the blurb, there is more to the story. Doing a Christmas novella is special, requiring a different approach. Readers who liked my first Christmas story wanted. I dug deep and pulled together a story from a few experiences I’ve had that meant something to me. If I can create a story that contains the lessons I’ve learned during my life and be entertaining at the same time, then I feel I’ve accomplished a miracle. My miracle wasn’t just finding love, but accepting it. Funny, I never thought I was one of those who “searched for love in all the wrong places,” but back then I was. I learned from my journey and thought it a worthwhile topic for my second Christmas novella. Also, the cat on the cover is the same cat we adopted. 3. What other romances have you written? Libby Edwards, a gifted horsewoman, unwittingly wishes herself back in time to Louisville, Kentucky just before Churchill Downs and the Kentucky Derby became a reality. 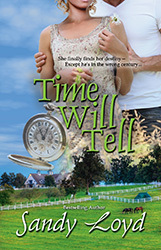 During Libby’s journey in the past, she stumbles upon her destiny. Unfortunately, he’s in the wrong century. In 1874, there’s no electricity, no Internet, no modern medicine, no antibiotics—no Starbucks! And even worse than that, women have no rights. Libby has no desire to stay. Widower Colin Thorpe, a renaissance man of his time, has big dreams. He is a horse breeder who names his thoroughbreds after Mythological Gods, because he has a reverence for past cultures and an appreciation for the unexplainable. Libby and Colin can’t resist falling in love with each other. After all, Colin accepts Libby for who she is, and she understands Colin’s dreams better than his deceased wife ever did. Yet he grasps early on that Libby doesn’t belong in 1874. And because his wife never adapted to the move from Virginia to Kentucky, becoming bitter and unhappy in the process, he won’t take the chance of the same thing happening to Libby. Can these two lovers find a way to be together despite their challenges? Michelle “Shelly” Matthews has decided to quit running from her past and meet it head on. Yet, nothing goes as planned, starting when she returns to her hometown to meet her ex-best friend, who collapses in her arms after making a puzzling statement. Shelly then survives two near-fatal misses that are too coincidental to be accidents. After a third incident, where she dodges a couple of bullets aimed at her, Shelly has no choice but to run again. Only this time she’s running with Jacob Collier, the man she originally left behind and the last person she intended to see. Jake Collier hasn’t got time to worry over Michelle Matthews’ hesitance to accept his protection. Women are dying of drug overdoses, his ex-wife included. Since he’s the lead DEA agent on his current case—and he believes the attempts on Michelle’s life are somehow related to it—Michelle is stuck with him. When another fiery attempt sends the two into deeper cover, hurtful truths about their pasts come out. Neither is guilt free. At this point, both Shelly and Jake wonder the same thing. Even if they do survive, can they find enough forgiveness in their hearts in order to love again? 4. Tell us about your kudos or reviews. My stories have tons of online five-star reviews. They’ve also won many awards, including the books mentioned above. 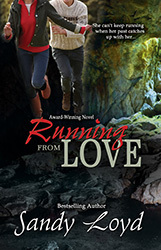 Running From Love won Denver Romance Writers’ Molly award for best romantic suspense. A Christmas Miracle, Book 1 won North Texas Romance Writers’ The Carolyn Reader’s Choice Award for Mainstream Romance and Time Will Tell won the Winter Rose Contest in the Paranormal Romance category. 5. How do you promote your books? I promote my books in different ways. Advertising is key. Also social media helps. Mostly I periodically have the first book in a series free. I find that readers who like my voice and stories will read more of my work. If you love animals, you’ll love these stories. Leave a comment below about a pet you’ve adopted, and you’ll be entered in a drawing for The Christmas Miracle story of your choice. 6. Where can readers learn more about your books and connect with you online? 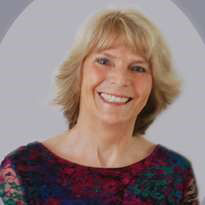 Thank you, Sandy, for visiting my blog and for offering a free ebook to one of my lucky readers! I enjoyed your Christmas Miracle novellas very much and look forward to reading your romantic suspense and time-travel novels, too! 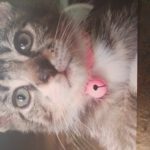 READER INVITATION: I hope visitors to this pro-pet blog will join in the fun and share photos of their pets! Each month, I’ll randomly pick one of the pet photos to feature on my social media pages and in my reader newsletter. To leave a comment and a photo, click on the word “Reply,” which is just below the social media icons for THIS interview. (Don’t scroll past this interview to the next interview.) Go Pets! I love books about pets, especially at Christmas! I have an 11 yr. old Golden Retriever, Rocco! Hi, Linda! Thanks for dropping by Sandy’s interview! I’d love to see a photo of Rocco, if you’d like to post one in this comments section. I’m giving away a free ebook to a randomly picked commenter at the end of December. Have a wonderful holiday season! Nothing like having fur babies in books, thanks! My dogs show such unconditional love. I can’t imagine life without them. This is Archie. We also have Joy who is camera shy. Archie is very handsome. 😉 And I agree that dogs are the epitome of unconditional love. What a great name for your dog. I’d love to see a picture too! We are a poodle and a reptile-owned family. We’re also backyard chicken farmers, have guinea pigs, parrots, and dumbo rats. Who needs to visit a petting zoo when you have your very own? Hi! We have our very own invariable petting zoo at home. Here is a pick of my bearded dragon. Hi, again. For some reason, the photo of your bearded dragon didn’t show up. I’m sorry. ;-( Sometimes I don’t understand blogging software. These sound incredible! I’ll definitely have to look into her books. While I LOVE all animals, seriously I’d bring them all home if I could, right now I only have Hedgehogs and rats. 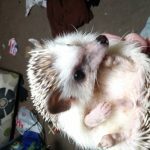 This picture is Xena- one of my rescue hogs- and she is the sweetest thing! I’ve never seen a hedgehog in person before. Yours looks adorable! I love her coloring and cute face. 😉 Thank you for sharing her photo. Have a very happy holiday and a great 2019! 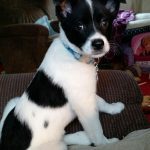 Yannie — I randomly picked one pet photo to receive a free ebook of mine, and your Xena won! Contact me at Marcia@MarciaJames.net with your choice of ebook, and I’ll email you the ebook. Congratulations! Awwww… What a cutie! Beautiful face and eyes. Thanks for sharing her photo! Have a wonderful holiday and a banner 2019! Hi all! Just a quick note to say thanks for such wonderful comments and pictures. I believe they all warrant a prize, so I’m awarding all commentators with an e-book of her choice. I’m sending out an email with instructions on how to claim your prize. Thanks so much for sharing your stories about your beloved pets.